The release of HTML5 introduced native Drag and Drop functionality to modern web-browsers. This means it is now possible to have movable elements on screen without the aid of frameworks like jQuery. 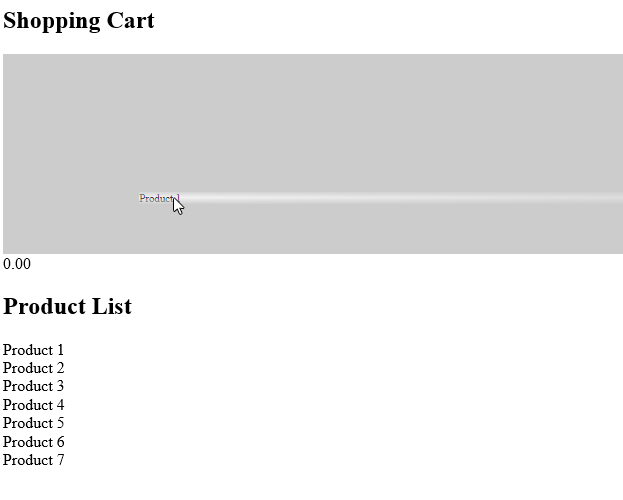 This week we’ll be taking advantage of the drag and drop functionality to create a basic shopping cart. The basic functionality we’ll cover, will be adding an item to the cart and if it already exists updating the quantity and totals. The first thing we’ll need is a basic structure for our cart and a list of products. To the product list, on each item I’m going to add a custom data-* attribute for the price. The data-* attributes allow us to store named data for a specific element. We’ll be using more of them later on in this tutorial. Along with the introduction of HTML5, the DOM selectors API was also updated. One of the most useful methods added is the querySelectorAll. This method allows you to use more complex CSS style selectors (like jQuery) to query elements. It’s much simpler to use than the older class and ID get functions. Here I am caching the product list items and the shopping cart list for use later on. As you can see the querySelectorAll function has made this much easier. Now that I have a list of products, I’ll have to make the draggable and add an event to setup some data when a product is dragged. To do this, I’m going to iterate through the items list and use the setAttribute method to set the draggable attribute to true. At this point I’m also going to add the dragstart event to each item. Here you can see that I have specified the function for dragstart as onDrag. The purpose of this function is to set the drag options and store the element id for later retrieval usinh the dataTransfer.setData. The event.dataTransfer object allows me to specify the default effects for the drag action. By default it is both copy and move, but here I have forced it to be move only. Now that the cart list is setup to receive the drop events, we can create our onDrop function. Once again the first thing we need to do is prevent the default event behavior, once this is done we simply pull out the id value from the dataTransfer object using the dataTransfer.getData function this time. Using the Id, we can now find the product in the product list. Before we add a new product to the cart, we must first check to see if it has already been added to the cart. I mentioned earlier that we would be using some more data-* attributes, the product id is the next one we’ll be using. To check to see if the product already exists we use the querySelectorAll function again, this time specifying an attribute based selector, providing the product id as a value to it. 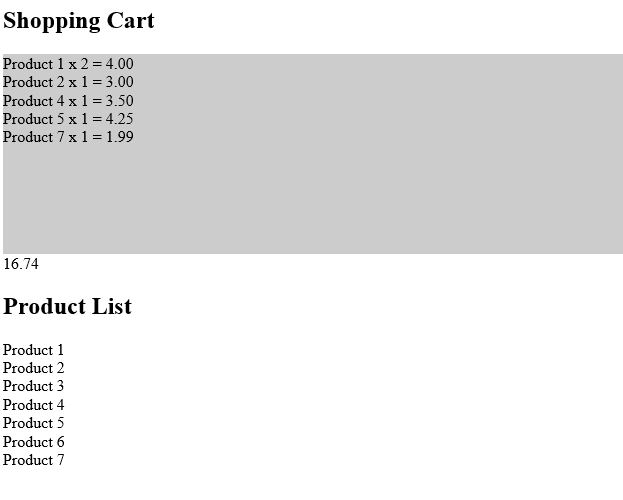 Now we can see if the the product is already in the cart by using the .length property. 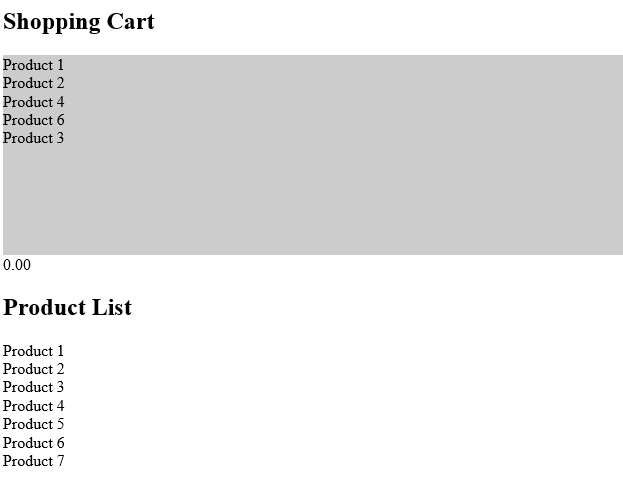 If the cart does not contain this product, the first thing the addCartItem function must do is clone the current list item. Now we can start setting specific data-* values. The first one we add is the data-d attribute, this is going to be the element id from above. Next, we set the quantity to 1 and remove the id attribute (as it must be unique on the page). We’re also going to add 2 new span elements to the list item. These will be the display elements for the quantity and sub-total for this product. If an item already exists in the cart, we will need to increment the quantity by 1 and update the quantity display value. Using the getAttribute function we can recover our current quantity and then increment it and update out quantity span element. Once the quantities have been updated, we now need to re-calculate the total values. Once again using the querySelectorAll function, we select out the list items in the cart and then for each one calculate its sub-total. Here I’m using the parseFloat function to ensure that we don’t lose any decimal place values. Before I update the display values I use the toFixed function to limit the number of decimal places to 2. And there you have it, a simple dynamic shopping cart. I’ve deliberately left out removing items in the shopping cart for you to give it a try on your own. It’s not difficult and there are several ways for you to try it. Just remember to call updateCart at the end to make sure the totals are always right!